Mobile Web Apps in 48 Hours or Less! With Futuresign Digital Network we can have your App Live in no time! Send Coupons and Specials. with just one click! Get the word out across Facebook, Twitter with Social Media Integration . Customize your Mobile Web App and add to any smart phone. Simultaneously Generate Mobile Sites to be viewed on Smart Phone devices. Let your customers view Live Streaming Video from your Business or Function. 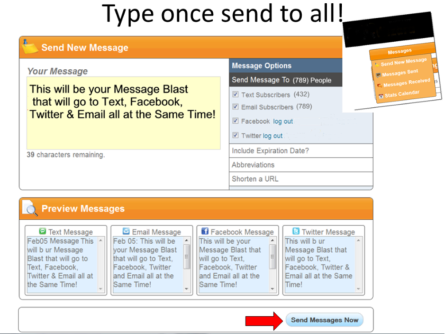 Tweet, SMS, Post to Facebook, & Email your App right from the admin Interface. Powerful Features Keep your Customers Engaged with your offerings. 1 Tap Calling feature allows the end user to place a call Instantly. Upload custom photos of your business and share as content in your App. Add your favorite Youtube Video or commercial. Add your business address and Futuresign Digital Network generates a Google Map for directions. Post Coupons on your App and update them anytime to keep your customers engaged..
Give your customers the ability to post reviews about your business on Yelp. Drive Customers to sign up and build onto your mailing list or allow them to email you from any smart phone. Send once and post to all Marketing Platforms. Your App users can post your App link onto their Facebook page with just a few taps. Allow your customer to Tweet your app or spread the word to hundreds via Twitter. Get the word out with our text messaging feature. Allow your App user to Share the App via Email to their friends. Exclusive only to Futuresign Digital Network, our type once send to all technology allows you to simultaneously send to all your customers via Text, Email, Twitter and Facebook with One Click Promoting of your Coupon offer or special event announcement! With your Included Integrated Marketing Platform, Promoting your Offers is a Snap! 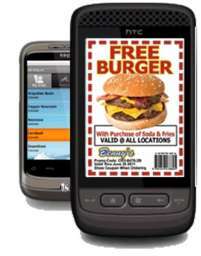 Send out Specials or Coupons to all your customers Via SMS or Text. With 97% of all text messages read, you know your offers are reaching your customers. You can find no better way to track your results than when customers redeem your offers. Have your Mobile Web App Live in 20 minutes or less! Announce a Band or Special Event! Get the word out about a Band or Special event, and let your customers spread the word and share the information with friends then watch the anouncement you just sent to Hundreds turn into Thousands! You harness the true power of social marketing!